Roland RP-301 Digital Piano, Rosewood The Roland RP301 is designed as an "entry-level" piano for students, teachers and professionals. With.. 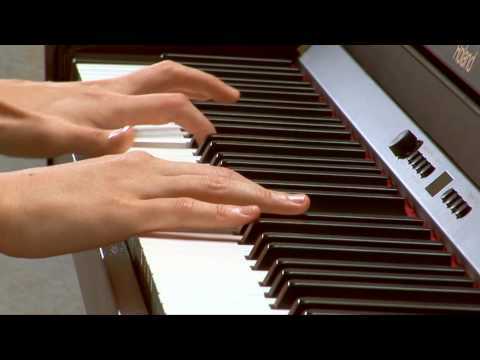 The Roland RP301 is designed as an "entry-level" piano for students, teachers and professionals. With its ultra real authentic sounds, compact footprint and practice friendly features, this piano will help you build your skills as a pianist. It has a metronome and recorder functions which make learning highly effective and also fun at the same time. With the onboard Twin Feature the RP-301's keyboard can be split down the middle so student and teacher can both play and practice at the same time. The SuperNATURAL Piano Engine delivers incredibly realistic sound and response, and the Ivory Feel-G keyboard is pure luxury. Enjoy a grand-piano experience at a fraction of the size and price. The piano also has fantastic Eco Friendly functions. It has an incredibly low power consuption and more importantly an Auto Off Function. This feature is particularly great if you forget to turn the piano off, you get an important call during practise or you have children who like to leave things on. The Auto Off function can be altered to varying lenths of time or shut off all together if you so desire. The final advantages of this digital piano is that there are no strings to tune meaning that whenever you turn this on, it will always react and play exactly how you left it last time. There is also no need to worry about temperature changes affecting the sound as all Roland Digital Piano's are tested to the highest relative temperatures.What more could you ask for? Roland's SuperNATURAL Piano was created by bringing together V-Piano Technology and 88-key Multi Sampling Technology. The SuperNATURAL Piano sound engine delivers natural and seamless changes in tonal colour in response to the player's touch. The notes have a smooth and natural decay just like your very own acoustic grand piano. The 88-key multi sampling comes from Roland spending hours analysing, sampling and synthesizing a variety of word class pianos and then faithfully reproducing these tones and resonance from key to key. The RP301 Digital Piano comes with an Ivory Feel-G Keyboard, featuring Progressive Hammer Action with Escapement. The Progressive Hammer Action provides fast repetition with authentic expressivness as you would find on an acoustic piano. The keys look and feel like Ivory to the pianist and feel great under the fingers and very comfortable to play. These features are taken directly out of Roland’s flagship pianos so to find them on a piano at this price point is truly amazing.